Lady S'theno (pronounced sa-the-no) is a naga and leader of the Coilskar tribe, the last remnants of Illidan's Naga. S'theno arrives on the legion prison world of Mardum and tells the demon hunter that Illidan sends his wishes for a speedy success. She assumes that the foothold is established for their arrival and comments on the way there that she sees another fel volcano. She is accompanied by Coilskar Sea-Callers, Coilskar Harpooners and Coilskar Myrmidons at all times on both on and off missions. Kayn Sunfury has the plans to give each individual faction to be given directly to them by the demon hunter. S'theno is in an agreement, however she wants to be done with this as soon as possible for it is no place for her kind here. Kayn later calls out for a report of how their doing out there. Unfortunately, there have been heavy resistance near the Soul Engine and need assistance. When the demon hunter arrives, she requests to save her naga from the pit lord General Volroth, and take out the dreadlord Count Nefarious inside the Soul Engine. After the Slayer captures the Fel Hammer, she acts as the recruiter for more naga troops. She also briefly appeared on Niskara. After spending months aboard "that stinking ship", S'theno begins to grow stir-crazy. When the Legion attacks Mardum she travels down to the surface and, after making a few snide comments about the demon hunters' vigilance, runs off on her own. S'theno aids the Slayer in defending the Fel Hammer from the Legion while questioning Matron Mother Malevolence how they even got aboard, to which Malevolence replies that the demons destroyed the ship's weapons first thing. After Lord Ar'dranath is killed S'theno decides that they must use the damaged weapons to destroy the enemy Legion ships even if it may risk the Fel Hammer itself. The plan succeeds, but the Fel Hammer is damaged. S'theno leads the search for replacement parts at the Broken Shore, though as she hates heights the Slayer is the one who does the dirty work and flies to the Tomb of Sargeras aboard a felbat for the materials. After returning to the ship, S'theno states that the Slayer has gone above and beyond to honor their pact, and though she is not one for sappy speeches, she is very grateful. You have gone above and beyond to honor our pact, Slayer <name>. You know I'm not one for sappy speeches, but I assure you that I am grateful. I will take my place by your side if you will have me. How can I aid you, little one? I wouldn't call what I do 'serving' the Illidari. It's more like... cooperation. I'm busy, but I can make time for you. You are not giving me a leg to stand on here. I think we need to scale back our relationship. How long would you say you can hold your breath? I'm just asking... for a friend. In the depths, no one can hear you scream... Well, they can, but it's really muffled. Well, at least this place beats Outland... Any place beats Outland. Fight well, slay many demons, try not to die. Lord Illidan is the one true master of the Illidari. Are you sure you need my aid? Slayer. I suppose I have time to help you. Can we do something more interesting this time? I suppose I will do this... for you. Lord Illidan will welcome your death! I will send you to a watery grave! You should have learned to swim! The Coilskar always get our way! Her generic name is Coilskar Myrmidon despite still having a female naga model. This is the first case of a naga myrmidon being a female. In Greek mythology, Stheno (Σθεννώ, "forceful") was the oldest of the three gorgons, with Euryale and Medusa as her younger sisters. 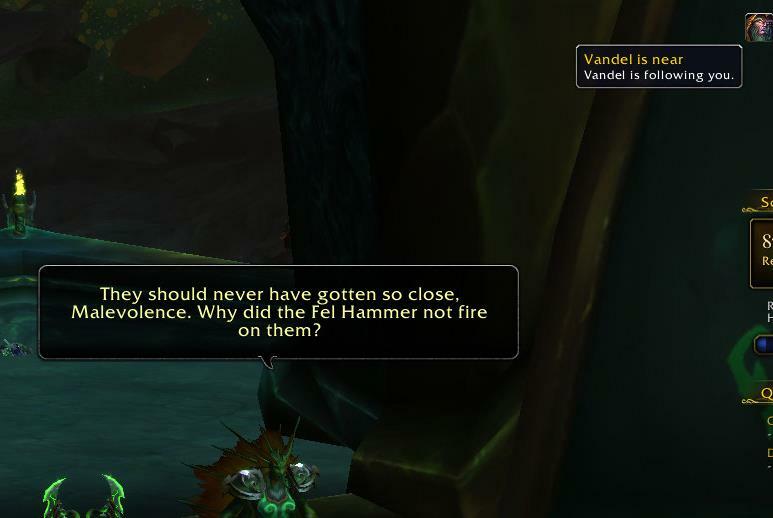 When the player is accompanied by S'theno during  Defense of the Fel Hammer, the ability marking S'theno as following them was actually named "Vandel is near" in early PTR builds. Since S'theno becomes a champion at the end of the questline, this may mean that originally the champion was meant to be Vandel. While most bodyguards mount up while the player is mounted up (with a ground mount and a flying mount), S'theno simply disappears when players are mounted and reappears when they dismount. This is likely because there is no mounting animation for naga. During the patch 7.2 PTR S'theno rode a Crimson Deathcharger, but due to the lack of a mounting animation she simply stood on top of it. She shares the same model with Hatecoil Crestriders.